You’ll never guess who was in New Brunswick last weekend, the one an only Matthew Chase – my partner in crime. Young Matthew is getting married this Christmas and he was in town for a fishing trip and his bachelor party – a story for another day. 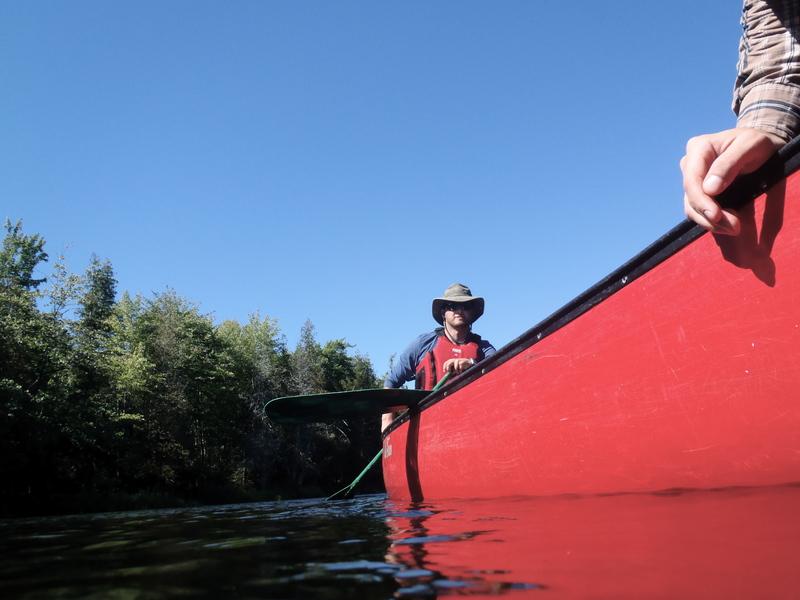 After a successful visit we could only think of one way to cap it off, a canoe run. 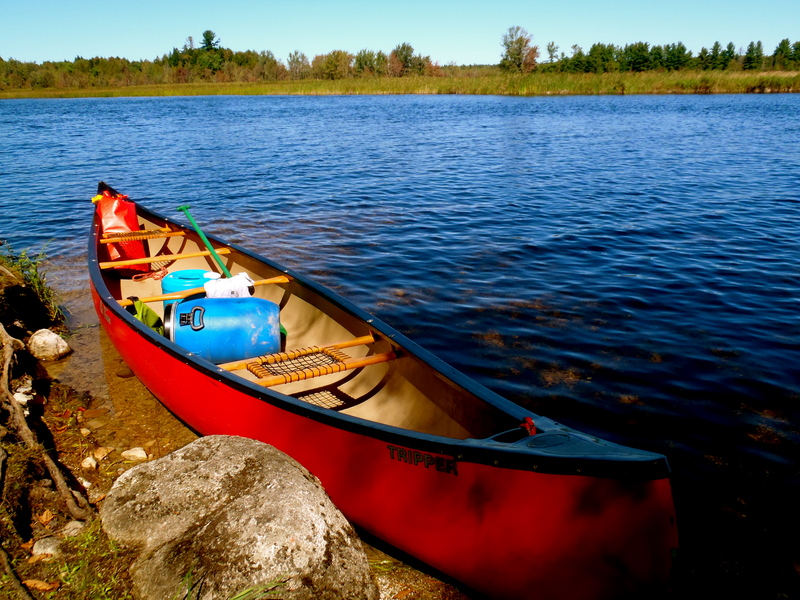 Unfortunately, water levels across most of the province were too low for canoeing. But — lucky for us — the St. Croix River in southwestern New Brunswick is dam controlled. The lower St. Croix is perhaps most famous for being the home of the first European settlement in North America north of Florida. In 1604, Pierre Dugua and Samuel de Champlain of France sailed up the St. Croix and established a settlement on the 6.5 acre, St. Croix Island. The settlement was ultimately unsuccessful – nearly half of the settlers died in the first winter – and was moved the following year. We were on the water around 11:30a.m. I was in the bow seat for the first time in a long time and it felt like old hat. 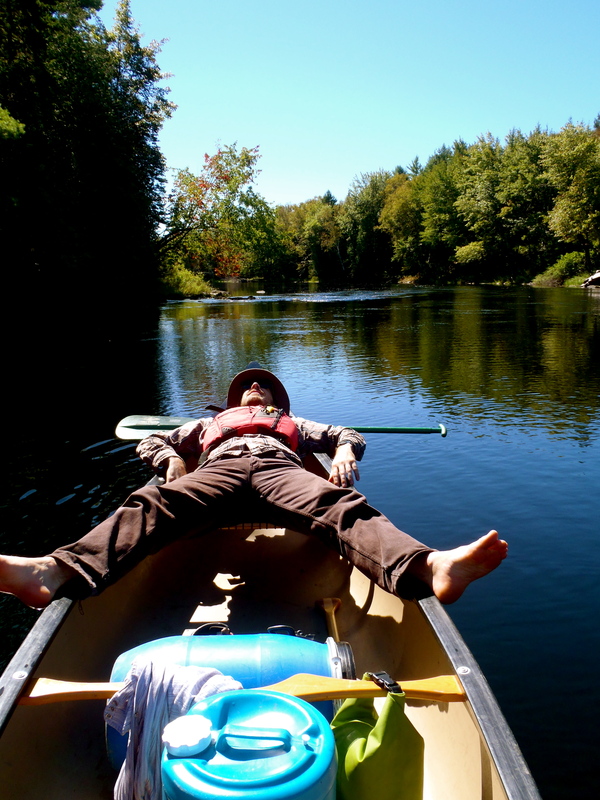 Long before I owned my own canoe, I was Matt’s bowman on some wild river trips. I’ve learned a lot since those days — I’ve given up my gunnel grabbing ways. 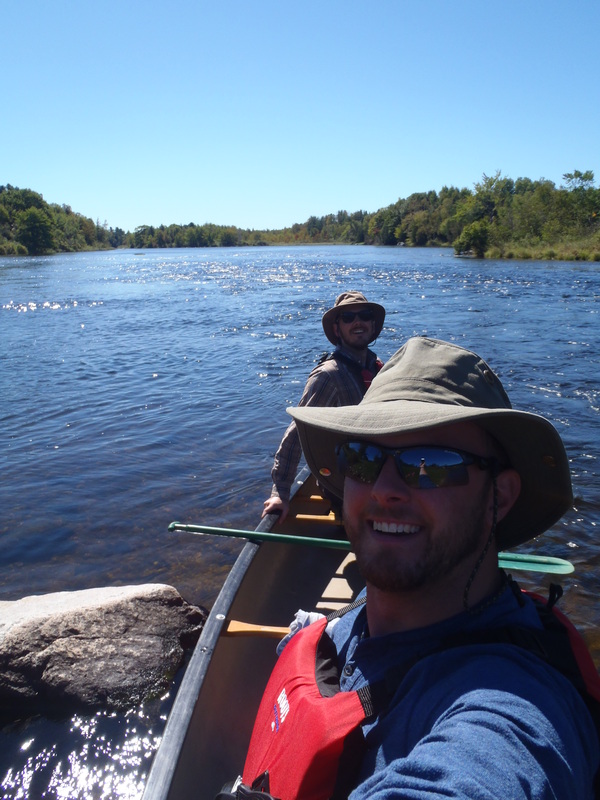 Our map indicated that that there were dozens of Class I-II rapids along the way and one Class III — Little Falls — all of which were broken up by large swaths of flat, slow-moving water. One of the first things we noticed was the abundance of old pulp wood that lined the river bottom. For parts of the 18th, 19th, and 20th centuries the St. Croix River was used to drive logs down river to local mills — the last of which was in 1965. Looking down through the crystal clear water and seeing the old logs gives you a sense that you’re paddling right over history. With some imagination you can envision what a log drive 100 years ago might’ve looked like. We were lucky to have the entire river more or less to ourselves — we only ran into one other group over the course of the day. With cabins few and far between, the river felt remote — a nice surprise. The natural landscape contained a diverse mixture of Acadian forest stand types along with wide open grassy marshes. The view from one of the many waterfront campsites along the way. We were nervous as we approached our first set of rips — Upper Wingdam Rips. Matt was on edge because he hadn’t paddled in over a year, and I was on edge because well, Matt hadn’t paddled in over a year. Mercifully, the old chemistry was still there and we made it through unscathed. By the time we reached Little Falls we were a well-oiled machine. At Little Falls we pulled out at the head of the portage trail above the falls — on the Canadian side — to scout it out. The trail would be a easy portage, if you were so inclined. The falls itself had two very different lines. On the right side — the American side — there are a series of ledges that appear to offer little reprieve, after which there is some fast moving water and not much else. The left side — the Canadian side — is longer and a little more complex. At the start of the rapids a line of rocks extends across the river which produces a series of small haystacks, after which rocks are dispersed across the river. After much discussion, we decided to go against the ranger’s advice and run the Canadian side. We both agreed that ledges are difficult if there is no clear passage — it’s too hard to control how the boat comes over the ledge — and from our vantage point on we couldn’t see one. We ran through the obvious “V” on the far left bank at the top of the rock line, down through the small haystacks, and past a couple of rocks on our right. After these rocks we moved into the centre of the river to avoid what appeared to be another small ledge on the left. After the ledge, we moved back to the left and were home free! Talk about fun! Don’t worry, I’m a professional. After the falls, the rest of the trip flew by. We stopped and marvelled and some of the incredible campsites along the way and discussed how great an over-nighter would be. We docked at the campground around 6:45 p.m., just as the sun was starting to get low in the sky. 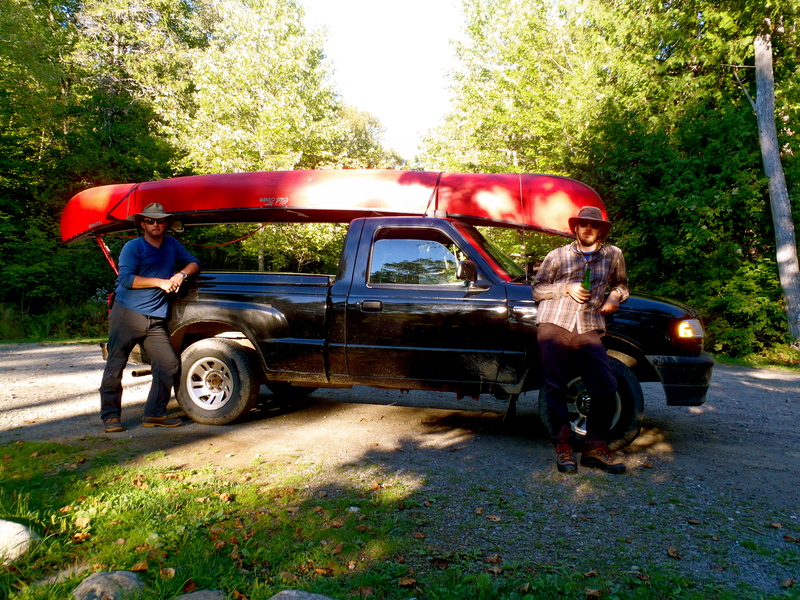 After loading the boat onto Jeff’s truck back at the train bridge, we shook hands and agreed that the St. Croix River is a river worth paddling.